I'm more of a robespierriste myself but relics of the royal family in their final days have a strange fascination. 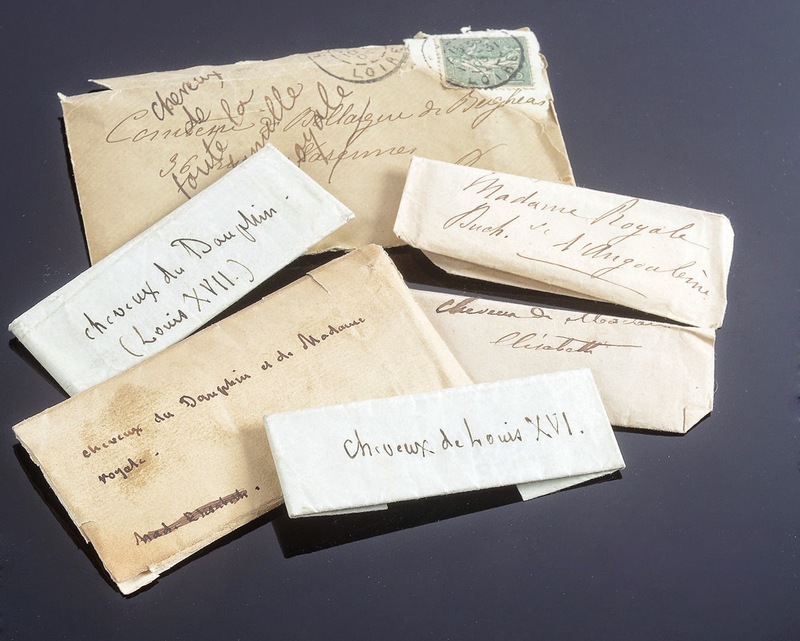 Yet more memorabilia went under the hammer in March this year, when Drouot auctioned the collection of the Vicomte Alcide-Hyacinthe du Bois de Beauchesne (1804-1873), Gentleman of the Court of Louis XVIII, and author of the first systematic investigation into the fate of Louis XVII [Louis XVII, sa vie son agonie et sa mort: captivité de la famille royale au Temple, 1853]. An important part of the collection relating to the royal family was bequeathed by the widow of Jean-Baptiste Gomin (1757-1841) who had been assistant to Laurent as guard of the children of France at the Temple between 8th November 1794 and 29th March 1795, and subsequently accompanied Madame Royal to Huningue in Basel in December 1795 to be handed over to the Austrians. Although many of the items exceeded their estimated value, the sale suggests that the big money at auction in France is still being made by autographs. Beauchesne's papers included many letters from famous 19th-century figures which did well; Beethoven fared best - his signature (Lot 2) made a whopping 46,000 €! 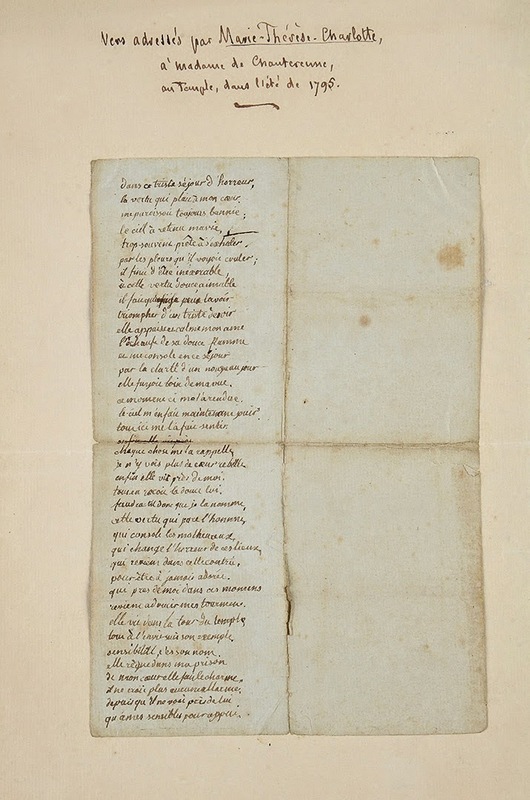 Letter, dated 2 October ?, addressed to either the duchesse de Polignac or princesse de Lamballe. The signature is a rarity - Marie-Antoinette usually left her notes unsigned or just initialed them. This lot fetched 18,500 € against an estimate of 3,000-5,000 €; quite impressive but not quite as much as Beethoven! A fair sum for tiny pieces of fabric! 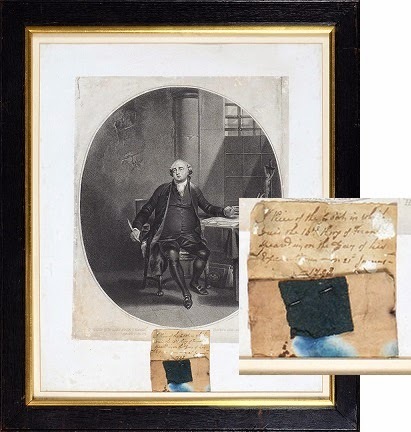 Lot 151 also included a travelling card of the "Comte de Falkenstein", the alias adopted by the Emperor Joseph II when visiting the French Court incognito in 1777. 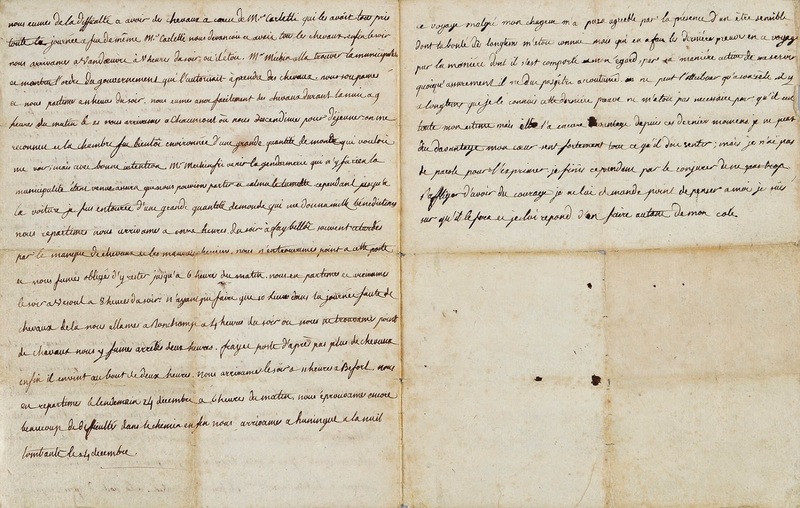 Lot 173: Autograph text of LOUIS-CHARLES, prince de France, duc de Normandie (1785-1795) - dating from the time of his captivity in the Temple. Lot 217. 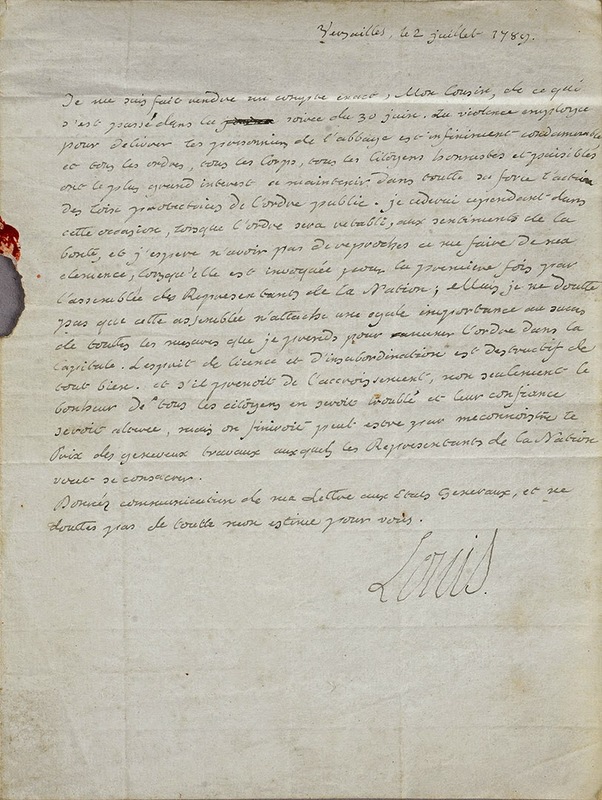 Letter from Louis XVI to the Archbishop of Paris Antoine-Éléonor-Léon Leclerc de Juigné, signed Louis and dated 22 July 1789. 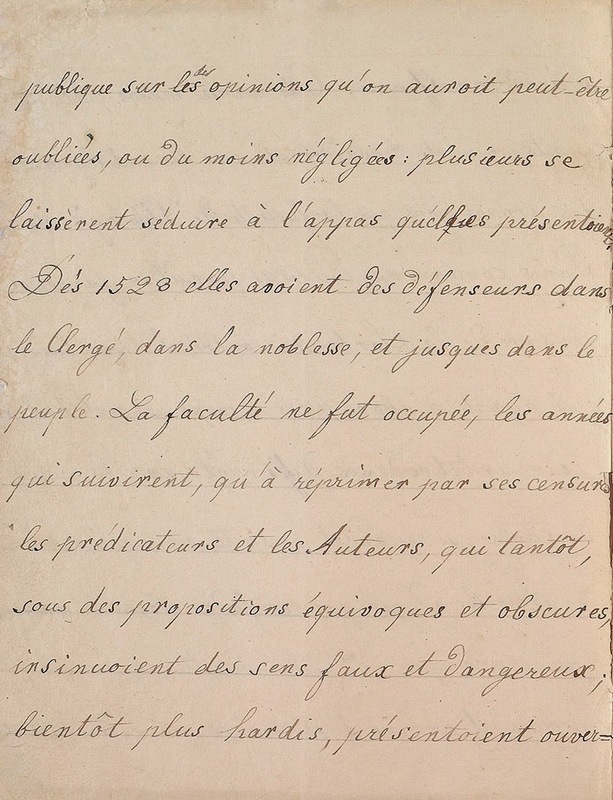 Louis authorises the release of mutinous soldiers being held in the Abbaye prison in a display of "clemency" and conciliation towards the Revolutionary assembly. A nice piece of evidence that Louis XVI was a reasonable sort of chap.....Unsold. Lot 218: Tapestry embroidered by Marie-Antoinette and Madame Élisabeth during their captivity in the Temple. Tapestry (needlepoint?) created by by Marie-Antoinette and Madame Élisabeth (39 cm x 80 cm). Coloured spots and pink bands on a black background. The ill-matched yarn show that it was worked with remnants of wool that the women had to hand in the Temple. The piece originally measured two metres long. It was offered by the duchesse d'Angoulême, as a keepsake to the Baron Théodore Charlet and later cut into four fragments - all of which survive among the Baron's descendants. A similar tapestry, intended for the salle du trône at the Tuileries palace. is to be found in the abbey Saint-Louis du Temple at Vauhallan. Estimated price (and reserve?) of 20,000 / 25,000 € -unsold.